Chelsea team doctor Eva Carneiro is set to lose her place on the bench for Sunday's trip to Manchester City after criticism from manager Jose Mourinho. She will no longer attend matches or training sessions. Carneiro will, however, continue to work with first-team players at Chelsea's Cobham training ground. Having had goalkeeper Thibaut Courtois sent off on 52 minutes, the Blues were later down to nine men for a period of Saturday's game after staff ran on to treat Hazard when he was tripped. If a player receives treatment on the pitch, he must leave the field. "I was unhappy with my medical staff. 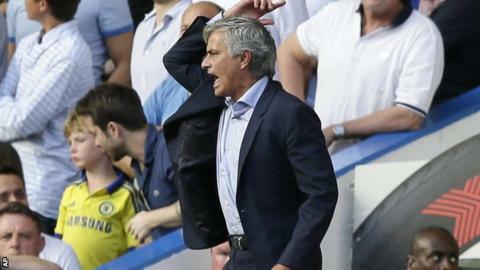 They were impulsive and naive," said Mourinho. "Whether you are a kit man, doctor or secretary on the bench you have to understand the game." Carneiro, who joined Chelsea in 2009, thanked people for their support on Monday. A club spokesman said: "We don't comment on internal staff matters."